Doing Therese de Dillmont Proud! If you’re a connoisseur of old embroidery publications, you’ve probably heard of Thérèse de Dillmont, who was DMC’s featured embroidery expert for many of their embroidery publications produced in the 1800’s. Though writing for DMC (a French company) and sporting a French name, Thérèse was, in fact, Austrian. She is perhaps best known for her Encyclopedia of Needlework, which can happily still be found in print through used book sources and can also be found online for free through places like Project Gutenberg. Besides the Encyclopedia of Needlework, there are a ton of other publications with her name on them, including pattern books, technique books, books dedicated to specific regional embroidery techniques. I’ve been collecting publications with her name on them for many years, and I still stumble on one here and there that I had no idea existed! Many of her works are available online for free through Antique Pattern Library, too – they’re well worth exploring! 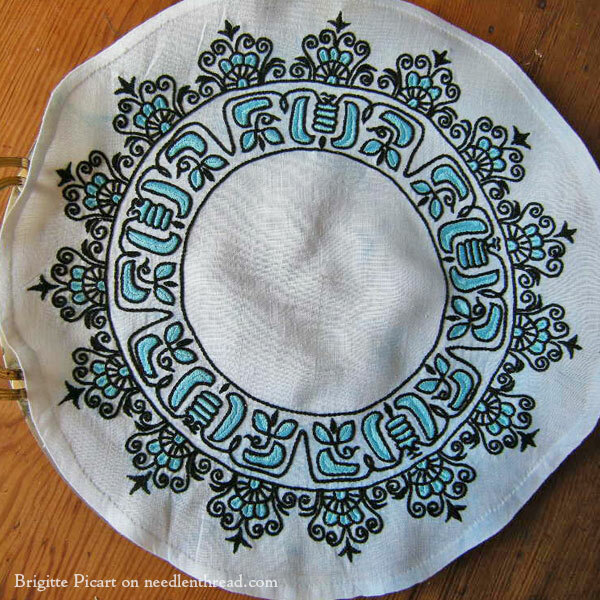 This gorgeous tray cloth was embroidered by Brigitte, as her first foray into non-counted embroidery. The cloth is about 12.5″ in diameter (32 cm). The original Hungarian-style design was a straight band with an angle in it, intended as a shawl border. It came from a Thérèse de Dillmont album. Brigitte adapted the design to fit a circular tray (not an easy thing to do, to manipulate a straight line design into a circle!). The embroidery is done with five different stitches. The combination of black and light turquoise is very striking and it complements this design beautifully. So pretty! Brigitte did a beautiful job on this piece, don’t you think? And it was her first “off the grid” embroidery! I love it! If you would like to explore Thérèse de Dillmont a little further, be sure to check out many of her works (available for free) on Antique Pattern Library. They’re full of great designs! Coming up, an “inside scoop” on embroidery classes, some new thread organization, some stitch instruction, and an introduction to possibly the craziest project I’ve ever been hornswoggled into undertaking! Thank you for posting the link to the works of Therese de Dillmont. I visited the link and am amazed at all the patterns and such a diverse array of techniques including fashion. Beautiful work! I love the colors! Thérèse de Dillmont’s books have lots of photos and drawings that can be used for embroidery NO MATTER which language is used for the text! I’ve just glanced through some of the patterns by Therese de Dillmont and they certainly are lovely and so many and such diversity of patterns. The above tray cloth is beautiful and as you say a difficult task to design a circle from a straight line pattern. 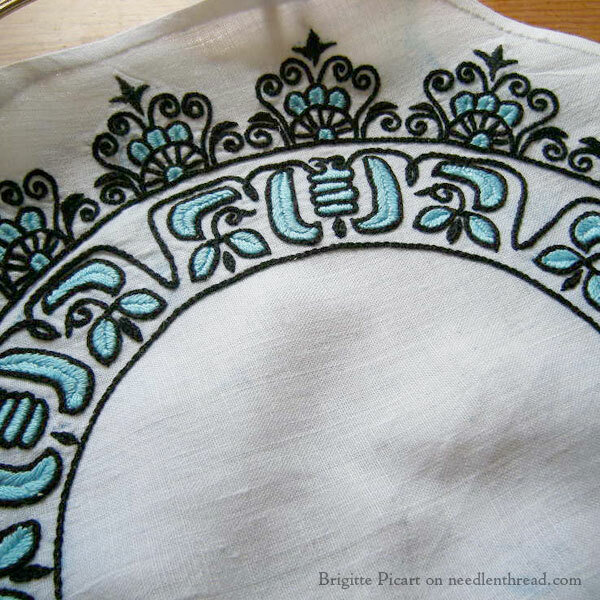 Thanks for the links to Therese de Dillmont patterns and for sharing Brigitte’s embroidery piece lovely. I look forward to a look at the embroidery classes and thread organisation and I can’t wait for the introduction to the craziest hornswoggled undertaking, sounds well, hornswoggled. Brigitte did a fantastic job with this project! I am looking forward to seeing your upcoming posts and projects, just like I always am. I do plan on going and looking around the Antique Pattern Library and seeing what new I can discover. Thank you for sharing and inspiring. Have a wonderful creative day! Beautifu Project!! Nice work, Bridgette. Faaaabulous Brigitte. Visually yummy enough to make my eyes Hungary. 🙂 🙂 And congratulations for whittling the square into a wheel. 🙂 Soooo many possibilities when you teach yourself to whittle. 🙂 I hope you are 100% proud of it, it is gooorgeeeeeous. Would it be possible to get the link directly to this pattern – especially the border? I guess I’m either a little bit lazy or not clever enough to find it but that border is calling my name! Beautiful work, and a lovely choice of colours. I was lucky enough to pick up a dozen or so of the Therese de Dillmont books when they were republished in the 1970s, and I was delighted to fill some of the gaps in my collection from Antique Pattern Library. I may not use many of the designs, and unlike Brigitte I’ll never achieve the standard of the work in the illustrations, but just looking at them is so inspiring. A lovely piece of work. Well done Brigitte! I have learnt so much from old DMC books, and the little green Encyclopedia is a always in easy grabbing distance of my working area. Such an attractive book. But more to the point, such a thoroughly sound and useful one. I love the combination of colors and the emphasis the black outline gives to the gorgeous turquoise. And I especially like the split satin stitch for the interior of each letter or whatever those little designs are. Gorgeous and inspirational! Split Satin Stitch was used for the light turquoise filling?? Thank you!! Can you tell what the other stitches are? Mary stated that she (Brigitte) used five stitches in this project….. Previous Previous post: Labor Day – Here’s a 12-Hour Break for You!